Insights on World Fluorite Industry - Is China monopoly approximating an end in the market? Fluorite industry, having endorsed itself as one of the most remunerative businesses of the overall mining sector has been gaining exceptional prominence in the recent years. However, triggered by the latest restriction on fluorite supply from China, the global fluorite industry has been witnessing consequential transformation in the product & price trends. In fact, the situation of tight supply and strong demand has pushed higher prices through 2018, enabling fluorite manufacturers to believe that the strong price trend will continue into 2019. Pertaining to this current market scenario, where inconsistencies in the demand & supply of fluorite is leading to significant price fluctuation, it would be apt to quote this business sphere to be highly volatile. Elaborating further, the robust demand for fluorite end-use markets, such as refrigerants (hydrofluoric acid) and automotive (aluminum & steel) has met with lower supply of fluorite on account of tight product supply from China – touted as the world’s largest fluorite producing market. The demand-supply inconsistency has had a profound impact on the global fluorspar industry, which, though categorized as one of the most lucrative business spheres, finds its name among the more controversial sectors – predominantly because of the environmental concerns aligned with fluorite mining. Regulatory environment-related norms mandated by the Chinese government have hit the fluorite mining sector hard leading to the collapse of several fluorite mines that in turn have majorly impacted the growth prospects of China fluorite industry. Quite surprisingly, the steep price hikes in the China fluorite market have not directly translated to the contact-driven European belt. With the collapse of fluorite mines and lack of supply from the large-volume producers, it was expected that these European markets would witness a depression. However, because of fixed price year-long contracts, the demand & supply gap was still being fulfilled, as per observations. On other hand, these regions have also ensured that the maximum demand for fluorite coming through the rapidly growing construction & automotive industries needs to be served by domestic production. In the backdrop of this scenario, several fluorite industry players have acquired and revived their fluorite mines across Europe to meet the growing product demand. 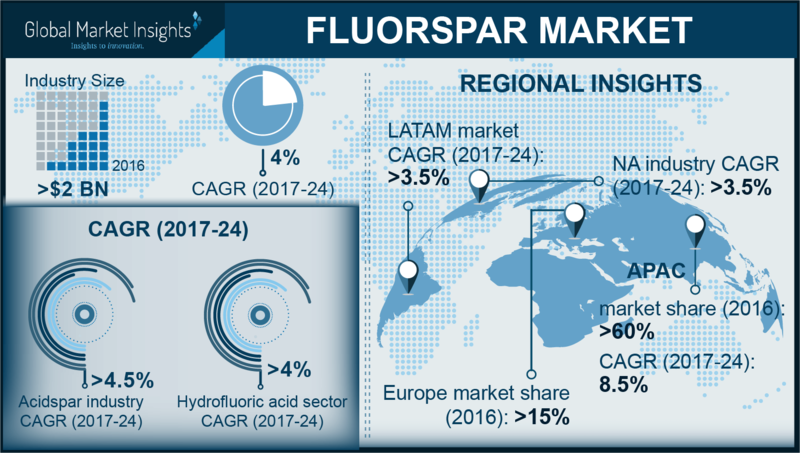 This has led Europe, driven by with Italy, France, and Germany at its foray to account for a significant share of 15% in the overall fluorspar industry in 2017. If reports are to be believed, North America is likely to emerge as the next lucrative hub for the fluorite mining companies. Moreover, with President Trump emphasizing on replacing the lost Chinese export supplies by expanding domestic fluorite production capacity at the current mines, industry analysts speculate higher investment scope in U.S. fluorite industry. The North American belt is home to the world’s second largest fluorite producer – Mexico, that caters to 18.4% of global supply. The further development work of the world’s largest fluorite producer, Mexichem in U.S. and Canada coupled with ongoing exploration activities, particularly in Sweden are poised to fortify North America fluorite market share in the ensuing years. It has also been stated that if the market trend of China exporting very less material continues for a longer period, the Mexican reserve would see higher material demand, leading to unprecedented growth in the North America fluorite industry share. The high demand observed from the regional hydrofluoric acid manufacturing plants, oil & gas sectors, and the automotive industry have also been identified as prominent factors that would augur well for the growth of North America fluorite market, which is anticipated to register a CAGR of 3.5% over 2017-2024. With South Africa’s SepFluor mine slated to bring a capacity of 210,000 tons of fluorite per year to the market by early 2019, the cost & demand supply gap between China & other regions is expected to taper down further in the near future. SepFluor, by accelerating the start of its Nokeng fluorite mine, is in fact pursuing its strategy of aggressively paving its way into the regional fluorite industry. Growth tactics such as these are expected to soften the high price scenario in the global fluorspar industry. The propagation of significant efforts put forth by the regional government in renewing fluorite mining rights have also substantially changed the growth prospects of the Kenya fluorspar industry. The regional players such as KFC (Kenya Fluorite Co) are expected to restart their operations after a long hiatus. Thriving on these progressive trends, analysts deem this region to be a lucrative investment ground as several fluorite mines would be looking to restart production activities under new investors. Analyzing the regional spectrum, it would be wrong to say that the fluorite industry has been epitomized by the shift from the China monopoly in the global market dynamics. However, it has been observed that the industry players are rolling up their sleeves in a bid to improve the market volatility and overall supply chain portfolio. The annual consumption of fluorite across the globe, when calculated more than half a decade ago, had been an average 5.6 million tons. A study indicates that there will be a shortage of 600,000 t to 800,000 t fluorites in the global markets by 2026, despite the current production rate. Nonetheless, with major regions resuming their production, analysts anticipate the fluorite industry to tread along a profitable growth graph in the ensuing years. Alongside, China is also expected to come up with more sustainable and environment friendly alternatives which are expected to generate significant a R&D scope for fluorite market players, particularly in the air-conditioning & automotive applications. Endowed with such dynamic regional and product sustainability trends, the overall fluorite industry according to a report by Global Market Insights, Inc., is forecast to cross USD 4 billion in terms of remuneration by 2024.